Firefighters battle 89 new wildfires across British Columbia on Monday, NBC News reports. 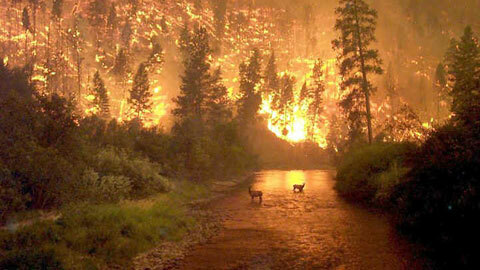 Forests in Canada are being engulfed by huge fires since Friday that brought 184 blazes across the Western Province. In fact, more than 800 homes were ordered to be evacuated since the province is under “extreme” fire rating fueled by drought this season. Saskatchewan is the worst hit with a recorded 13,000 evacuations, 5000 of which will be housed in facilities in Cold Lake, Alta. The National Weather Service in Seattle announced that smoke plumes have covered a huge part of Vancouver Island down the westside of Washington State’s Olympic Peninsula. Dustin Bonk, Meteorologist of NBC Station WILX of Lansing Michigan, backed this up by saying that the smoke has risen over 20, 000 feet but it has not come to a point where it is health alarming. The Weather Network confirmed that over a thousand Canadian forces were already deployed in the affected areas and about 600 soldiers will be receiving firefighter training. 8,000 people from Air Ronge, Lac La Ronge and La Ronge have already been evacuated over the weekend.